Rats. Back in business. Roll to the bottom of this post for a description of the Army Corps of Engineers 40-year plan to haul dredge-sand in trucks through our river towns and dump it on prime farmland. Our latest sand-in-trucks puzzler. Sand-mine fever is abating here in Buffalo County, mostly due to the prices of oil, gas and thus frac sand — coupled with a lack of local rail lines. A sand mine that doesn’t have a rail spur into the mine has always been at a huge competitive disadvantage. That problem was masked by extremely high prices during the early years of the sand boom. But since the boom has ended, the only mines that stand a chance of surviving the cost pressure are the ones that have direct rail access. Buffalo County (like many others in this region) is locked in a win/lose battle where either mining interests are going to win or the people who oppose them will win. As long as we continue to frame the discussion the way we have, somebody has to lose. Here are three maps to describe what is happening. I used to lobby that we should try to figure out a way to turn this into a win/win conversation where opportunities and way of life are preserved for all of us rather than those of us who win. I’ve given up on that, and now focus on supporting county and region-wide efforts to stop these projects. I still believe there’s a path to win/win but the miners aren’t listening. In the southeastern two thirds of the county lies the unique river and coulee country (a part of the unique and fragile “Driftless Area” habitat) where the focus is on recreation and tourism. In the northeast are the rolling sand hills that actually extend across much of central Wisconsin all the way up into the northwestern lakes region where the economic emphasis is more on agriculture and small industry. This is a representation of the situation that will develop as sand trucks from mining sites are routed through the Driftless Area Coulee Country on their way to destinations in Minnesota. This is a classic “win/lose” situation where one side will prevail at the expense of the other. Each side of this win/lose conversation is afraid of losing the battle. That fear is turning into anger, the anger has split our communities. This, in my view, is a Bad Thing. Many of the mines depicted in this drawing have been denied or are being opposed in court. And the two Minnesota loading destinations are at capacity and no longer accepting additional traffic. This, in my view, is a Good Thing. But the stakes in the win/lose conversation get even higher if the Driftless Area Coulee Country becomes a transportation hub. 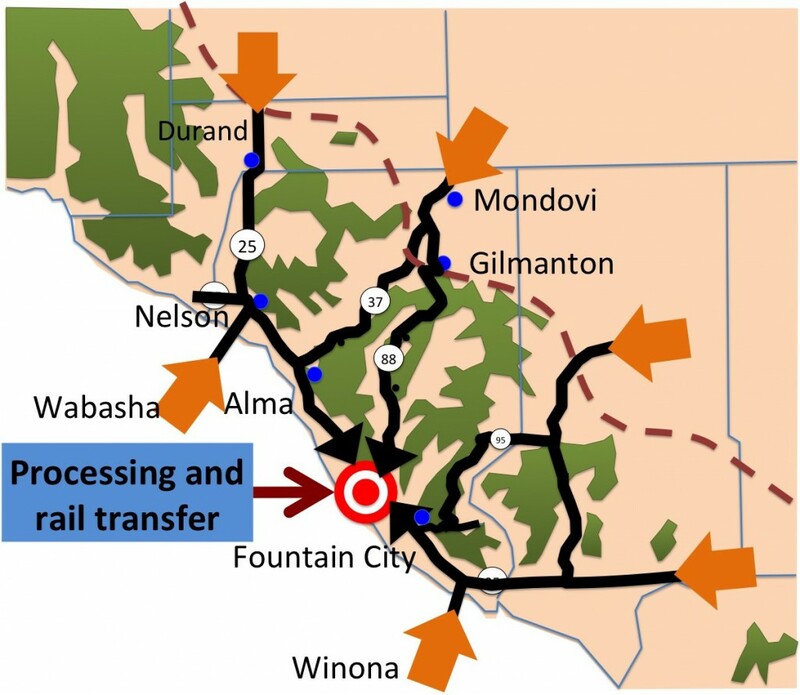 Permits have been repeatedly sought to build a rail spur and frac sand loading facility at the intersection of Wisconsin highways 88 and 35. If that (or a similar) facility gets built along the Great River Road we not only become the transit provider for local sand, but regional sand will start flowing into the county as well. 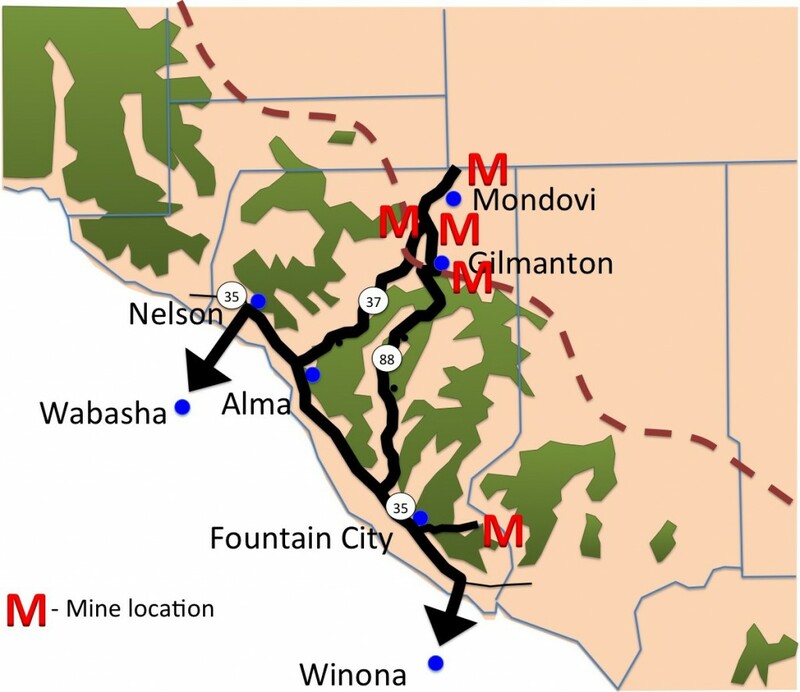 Winona’s processing facility has been closed to Wisconsin sand trucks, with Wabasha probably not far behind. 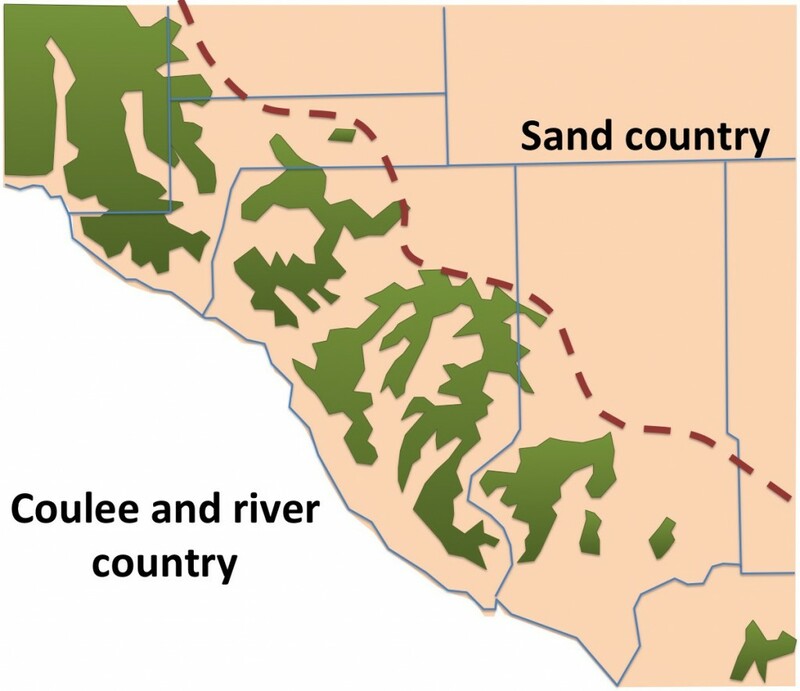 What happens to the Coulee Country in a scenario like this? It’s not surprising that people are frightened. Two separate attempts to build this facility have been turned back through concerted community effort. Over 2500 people participated directly or indirectly in the latest round. This, in my view, is a Good Thing. 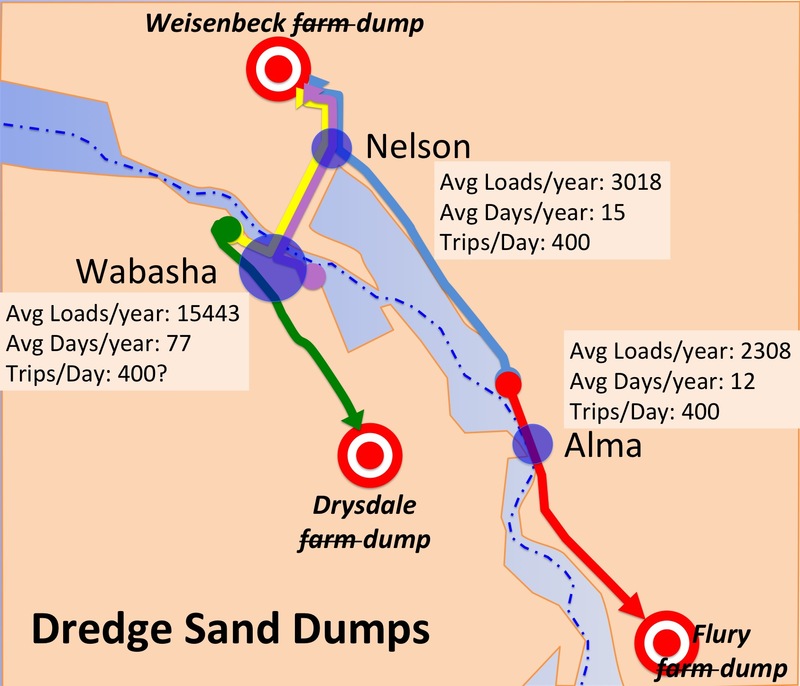 The Corps of Engineers has come up with a plan that will transform three pieces of prime farmland into dredge-sand dumps and transport the sand to those dumps with trucks through the three river towns that surround Pool 4 of the Mississippi River. The most-recent posts are about this issue.